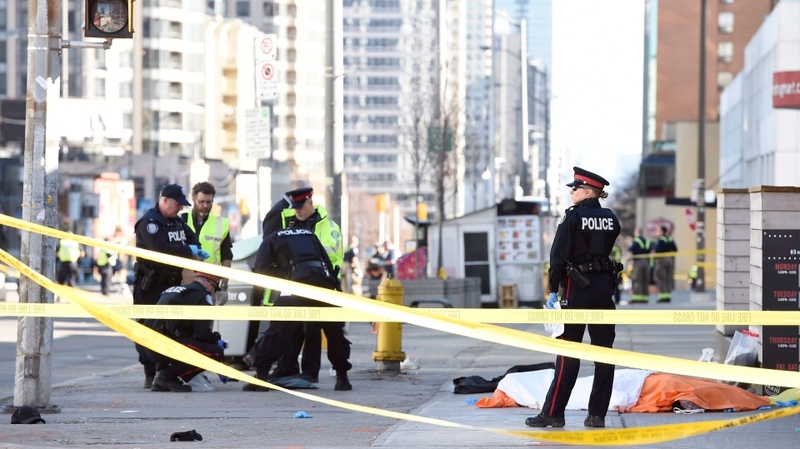 OTTAWA -- A man has been charged with 10 counts of first-degree murder and 13 counts of attempted murder after a van struck pedestrians along one of Toronto's busiest thoroughfares, conjuring memories of recent similar attacks, including in France, Germany and Spain. Monday's events sent the city reeling, sowing confusion and fear. So why have no terrorism charges been laid in the case? The Criminal Code defines terrorism as an act carried out "for a political, religious or ideological purpose, objective or cause" intended to intimidate the public by causing death or serious bodily harm, endangering health and safety, or interfering with an essential service. The code includes offences that target financing and participation in a terrorist group, as well as facilitating and instructing others to commit terrorist acts. When Criminal Code offences for terrorism were introduced as a part of the Anti-Terrorism Act in 2001, Parliament decided that one of the things that should help distinguish such offences from other forms of violent crime was the specific motivational definition, said Wesley Wark of the University of Ottawa's graduate school of public and international affairs. "Some violent crimes may have the same effect as terrorism but if the motivational element cannot be demonstrated then they are not considered, legally, acts of terrorism, even if they terrorize," Wark said. It can also be difficult for police and legal counsel to establish the motivation in a way that meets the evidentiary standards of a court, he added. The terrorism offences in Canadian law "do not work well" with so-called lone-wolf suspects who act on their own, given the code's emphasis on participating in or contributing to the activities of a terrorist group, said Kent Roach, a law professor at the University of Toronto who has written extensively about national security. There is expert consensus that whenever it's appropriate to lay terrorism charges, that should happen, even if it makes no ultimate difference to the criminal sanction, such as the length of sentence imposed, Wark said. After six people were fatally shot at a Quebec City mosque in January 2017, Prime Minister Justin Trudeau was unequivocal. "This was a group of innocents targeted for practising their faith," he said. "Make no mistake -- this was a terrorist attack." 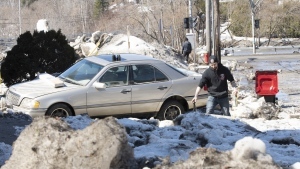 However, no terrorism charges were laid against shooter Alexandre Bissonnette. He pleaded guilty to six charges of first-degree murder and six of attempted murder in connection with the attack. In October 2014, a gunman shot a sentry at the National War Memorial before storming Parliament Hill, ultimately dying in a flurry of bullets in the Centre Block. Michael Zehaf Bibeau said his actions were spurred by Canada's military involvement in Afghanistan and Iraq. In a grainy cellphone video made shortly before his attack, he spoke of assaulting soldiers to show Canadians they are not safe in their own country. Some months later, Bob Paulson, commissioner of the RCMP at the time, said the Mounties consider Zehaf Bibeau a terrorist and that he would have been charged with terrorism offences under the Criminal Code had he survived.